This section is devoted to books, magazines, and articles we find particularly interesting. Each segment is not intended as a review or a synopsis of a work, but more like a general impression of the content, writing, and how much we get from it. Because we’re more than just a little ADD, we’ll jump around a lot – reading some, then jumping ship, only to return again. If you’re looking for user reviews, we suggest going to Amazon. I love this book. I love it so much, I just leave it on the coffee table and let people who come over see how much I know about whiskey. I bought this during a recent whiskey-heavy phase in my life. I grew up in a household that didn’t really covet hard alcohol. Sure, Mom had her Gin and Tonics on the back deck during the warm months, but Dad always stuck to the craft microbrews of our Pacific Northwest or the wines from just about anywhere. The abrasiveness of my first taste of liquor at the age of fourteen, combined with (I’m guessing) the ease at which I developed a taste for those incredible beers that were brewed a mile from our house made it easy to steer clear of the hard stuff most of the way through college. I just wasn’t interested. I’d gladly drink a warm, skunky Silver Bullet over a sip of Jack. It was psychological and guttural, and I wanted none of it. Then I moved to New York and got a job as a barback. It took a long time to develop a taste for whiskey. In fact, it took a long time for me to develop a taste for nearly everything complex that I now enjoy. I feel like I can trace those moments of revelation, when suddenly any psychological barrier I had was dismantled by the wonderful flavors presented to me. Often, this has come with a mixed drink. With gin it was the Aviation, then the Last Word. With whiskey, it was the Smash, and then the Manhattan, and then (oh holy of holies!) the Sazerac. These were gateways for me, if that applies, to breaking down the harshness of the alcohol and really, truly tasting complex flavors. I still wince a little at the night’s first sip of straight whiskey, but it’s more like the shock of walking from a warm house into a gust of sharp, cold wind. It’s a surprise, but it can also be refreshing to the senses. So, with that in mind, I’ve been trying to teach myself more about the liquors that form the basis for so many cocktails I love and serve. I want to know what, for example, is the difference between an American straight rye and a Canadian rye. Why do those silly canucks call EVERYTHING rye? Bat-crazy woodland talk, if you ask me… I want to know why different gins have such varying proofs, and why they can have such varying flavors. Knowing this will help me in being able to more accurately compose my drinks – it’ll make me better, faster, stronger at what I do…. 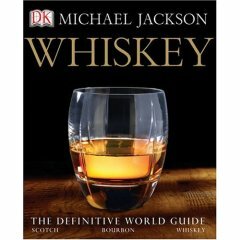 Micheal Jackson has, I think, put together a fantastic overview of whiskey. I went into the reading of this book with almost no knowledge of distilling and very little understanding of the basic differences in whiskey groups. After reading the first section of the book (Understanding Whiskey), I find myself both totally interested in the idea of someday distilling my own spirits, and more than a little annoyed that I can’t just go buy a still and blow myself up. Whatever, feds. After that comes a lengthy and in-depth discussion of aromas and flavors. Were I more knowledgeable and familiar with whiskey, I bet the provided information would be less academic and more applicable to my palate. But I’m not quite there. I did, however, take a lot from it; the discussions about climate, geography, grain, seaweed (! ), water, heather, peat, etc. make me completely appreciate the value of what I pour in my glass. I’ve found myself pulling a bottle for a customer and slowly – ever so carefully – pulling the cork and pouring it into a glass. I do this almost unconsciously, as though my slow and calculated movements are measured in respect to the countless years of love and hard labor that went into every ounce. It’s comically romantic, sure, but it’s also sort of cult-ish. Basically, I finally understand. I understand the connoisseur’s mind, even if I am an infant in comparison. I understand that one can devote much of their time and intellect to the study of a liquid, a liquid that has such an interesting and muddled history, but is almost Christ-in-a-glass to those who worship at its alter. It’s fun to love something that much, and I wouldn’t mind being cool enough to join the group. The bulk of the book is a breakdown of the different varieties and the various whiskey-producing countries: Scotland, Ireland, Canada, the US, and Japan. Though it’s very heavy on the Scots, there is fantastic information for everything. I’m still reading certain sections, but the layout of the book is such that you can jump around at your pleasure, learn something about the bottle you just bought (with tasting notes to boot! ), or explore distilleries that you’ve never even heard of. It’s not just a book about the amber liquid; it’s a book about the process, the culture, the history, and the esteem of whiskey. Even though the title might infer it, this book doesn’t pretend to be the total authority, but rather pushes you out into the world so you can discover you own tastes and impressions. All with the aid of pretty, pretty pictures. In short, I really think this a great introduction for the beginner and (I’m guessing) the more experienced whiskey drinker. The text and subject matter steers clear of pretension and really engages, even with subjects that can be abstract from time to time. This entry was posted on August 6, 2007 at 6:40 pm	and is filed under Liquid Literature. You can follow any responses to this entry through the RSS 2.0 feed. You can leave a response, or trackback from your own site.